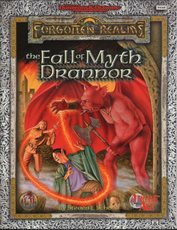 Note that this set takes place in "Modern Day" Forgotten Realms, but it serves as an excellent bookend with its prequel, "The Fall of Myth Drannor." 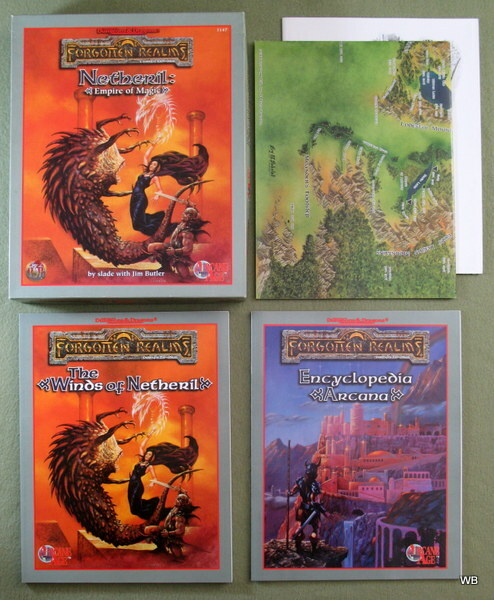 The set was later reprinted in the deeper box format TSR used in the mid-90s. The color is a lighter green than the first printing, otherwise there are no differences I can see. The date is hard to pin down. The box does use the TSR "shield" logo, and a return card inside is dated 1994, otherwise everything retains its original 1993 copyright. Since it still has the 156076-series ISBN, it would have to be before mid-1995. "MYTH DRANNOR, city of glory. We shall not see its like again. PERHAPS YOU'VE HEARD ITS SHINING STORY... of a time when elves and dwarves, gnomes and halflings and men lived and loved together, striving to create beauty and right wrongs. Magic was brighter then, in the City of Song. Folk were richer then, in the City of Wonder. Once this proud city stood as the highest jewel in the glittering crown of civilization. THERE CAME A DAY when it was overwhelmed by evil, thrown down, despoiled, and left a ruin in the heart of its encircling wood, as all things of beauty are. Evil spawned and crawled there, and the elves kept watch around it, that evil might not spread. Centuries passed, but the tales let few forget the powerful magic, the great treasure - and the deadly horrors that lay waiting within its walls. Now the elves are gone, and adventurers from a hundred lands and cities are rushing to Myth Drannor, to seize what they can of the long-lost glory. If the bards and sages are right, power lies there for the claiming that could change the face of the Realms, rule kingdoms or lay waste to them. If you would be a part of this exciting quest, this boxed set is for you. Inside await four poster maps, eight cardsheets, eight MONSTROUS COMPENDIUM sheets (Aratha; Baelnorn; Blazing Bones; Doomsphere - Ghost Beholder; Electrum Dragon; Fang Dragon; Dread; Feystag; Lythlyx; Magebane; Metalmaster; Naga - Bone; Ormyrr; Windghost; Xantravar; Xaver), and two booklets - a 128-page Campaign Guide, and a 32-page Adventure Booklet - filled with details about Myth Drannor, a fully-detailed campaign setting for high-level characters in the world of the Forgotten Realms. 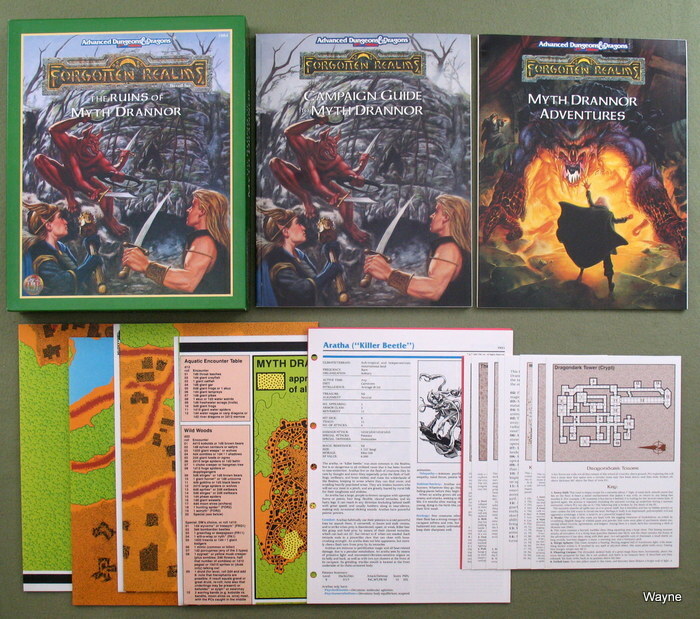 New monsters and magical items await to sparkle and challenge in any AD&D campaign - and this set lays bare the secret at the heart of Myth Drannor: the fabled mythal!" * The Winds of Netheril: This 128-page reference book contains the long-awaited his most mysterious kingdoms. It provides new rules for spellcasters during the reign of Netheril and the rules for time-traveling within the Realms. An encompassing almanac details the floating cities and groundling cities of lost Netheril during the different ages of the nation. In addition, this book explores the floating city of Karsus, noting key landmarks in the most important enclave of Netheril. Many of Netheril's most prominent personages are likewise detailed. The book concludes with MONSTROUS COMPENDIUM entries for the phaerimm, sharn, and tomb tapper. * Encyclopedia Arcana: This 32-page book describes many of the magical items and spells of Netheril. Also included are spell lists specialized for use within a Netheril campaign. * Two Poster Maps: Full-color poster maps show the lands of Netheril during the height of its power and at the time of its fall. The back of one of the mapsheets contains a detailed look at the enclave of Karsus." "As the floating cities of Netheril hover peacefully in the air, the winds of intrigue boil all around them. The phaerimm continue to plot the downfall of the Netherese even as Karsus prepares for the casting of his greatest spell. Undead walk the land, driving orcs and humans before them. And somewhere below the greatest nation of Faerûn, the Tarrasque awakens from a long slumber. * Gather the components that Karsus requires for casting his 'most wondrous' spell, the only 12th-level spell ever known. He just needs a few body parts from two creatures -- a gold dragon and the Tarrasque. * Reunite lost lovers after they have been seperated by death. Nopheus's wife was killed in a magical explosion, and now he's finally saved enough money for her to be resurrected. Certainly a dead body couldn't pose a threat to a band of stalwart heroes?! * Follow the winds of Fate to wherever Tyche delivers them. Numerous side adventure allow players to take their characters to a variety of different locations. Some heroes might want to follow the trail of the missing nether scrolls, while others might want to join the resistance and fight Karsus and the other archwizards. But only the bravest hearts can take the first step..."
"Step into the past of 650 DR and experience the sights, sounds, and innumerable wonders of fabled Myth Drannor at its height. Walk the wooded glades of Cormanthyr, the last major elven empire on Faerûn, and discover marvelous secrets lost to the Realms of the present day. 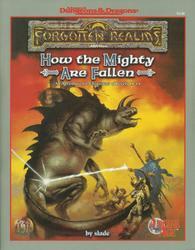 This ARCANE AGE campaign expansion for the FORGOTTEN REALMS setting contains all the information necessary to begin either a full-fledged Cormanthyran campaign or a journey back in time some 700 years to see the City of Song at its most glorious. This 160-page book contains exhaustive details on the history, culture, military, society, and citizens of the forest nation of Cormanthyr. Features include a timeline of elven history on Toril, a rundown of Cormanthyr's ruler and important individuals, plus more information on the city of Myth Drannor at its height as well as on the communities of Semberholme and the Tangled Vale. In addition, a new speciality wizard, the elven dualist, is introduced and detailed. Also included is a large section that gives the reader knowledge of the elves' magical rites, rituals, and unique magical weapons and items. Features include new and expanded rules on the elves' potent High Magic, moonblades, and the multitude of magics that helped make Myth Drannor the glittering gem of Faerûn that it was. 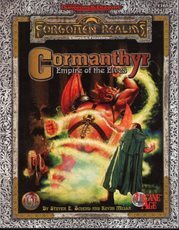 Finally, a two-sided, full-color map of the nation of Cormanthyr and an aerial view of Myth Drannor complete this exciting package -- the largest collection of elven lore ever." This accessory struck me as being rather unusual for a TSR AD&D product... It's a military history book. While adventure hooks are sprinkled liberally throughout, its greatest detail is in the battles and campaigns during the Fall of Myth Drannor. This product may not be for everyone, but I certainly enjoyed it. The Fall of Myth Drannor is an accessory detailing those horrible years encompassing the Weeping War, for use with the Cormanthyr: Empire of Elves book. Herein you will find the causes of the Fall of that most lyrical of elf cities; highlights of the twelve campaigns and their most significant battles; copious adventure hooks for involving player characters in behind-the-scenes activites; and new (or should we say ancient?) magical items and spells, most of which have been lost in time. From the passing of Coronal Eltargrim to the shattering of the Khov Anilessa's invisible prison to the stand at Honorsgate, the painful history of the Fall lies within these pages. Now comes the opportunity for heroes to be made -- or become part of the history in their attempts."